The newly installed virtual reality station at the New Canaan Public Library on Nov. 24 2017. NEW CANAAN — Virtual reality has gained traction in the past year and the New Canaan Library is investing in its educational potential. The Oculus Rift system — an eye-covering headset that allows the wearer to visually immerse themselves and interact via hand-held controllers with the setting of their choice — is now available to library goers. 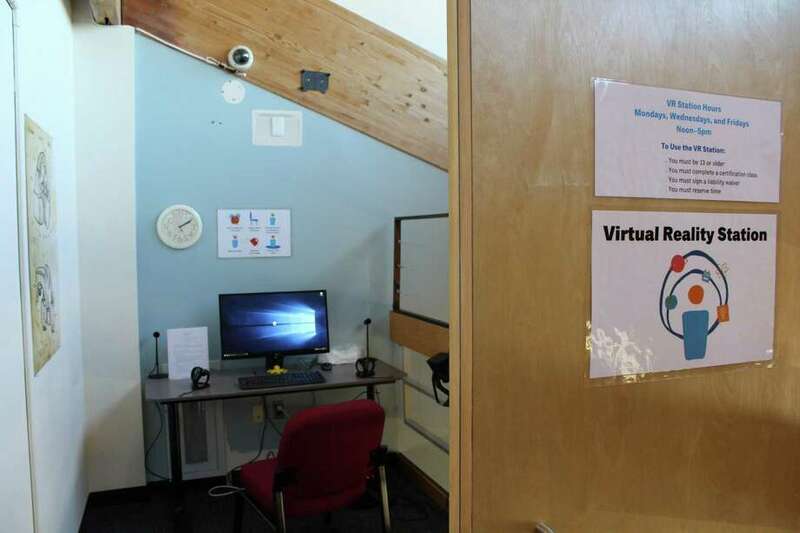 “We like to monitor new and exciting technologies and now that the price of the Oculus had dropped down considerably we thought it was a good time to take advantage of it,” Jeffrey Zaino, head of digital services at the library, said. The price for the Oculus Rift system was originally at $799 but when it dropped down to $399, Zaino decided it would be a good time to invest in the technology. Those interested in using the station have to participate in a short introductory class. The virtual reality station counts with over 20 different games. Library patrons will be able to enjoy trips to outer space with Apollo 11, go back in time to explore the Acropolis in Athens or even take a look inside the human body. If there is one limitation, it’s the confined space in which the station is located though there are plans to hopefully expand the virtual reality area into a larger space which would allow for more movement. “Most of the games we have are designed to be played while sitting down,” Zaino said. Classes began on Tuesday Nov. 20 and will continue to be held every Tuesday throughout the month of November.